In honour of the weather and how it inspires me, I went looking for a loaf recipe using Autumn spices and Chai for our homeschool moms night. No pumpkin, though. The lone specimen we’ve managed to grow isn’t quite ready yet (though on inspection it’s closer than I thought). I should just keep tins of pumpkin puree on hand, I think. 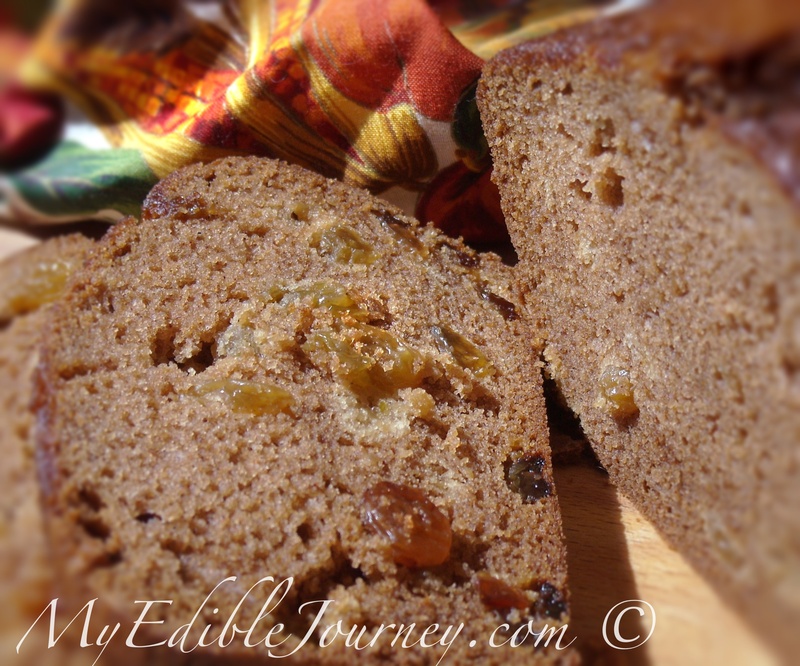 I found a recipe for Honey and Spice Loaf Cake on Epicurious. It looked promising, though not quite what I wanted. But at least I could use a Chai tea bag for flavour, rather than needing cardamom, which I never have, or some pre-powdered spice blend as so many other recipes called for. And the wonderful dark maple syrup that we’re blessed to be able to pick up at White Meadows Farm would work well in place of the honey (they ship it, if you can’t get the good stuff where you are). You would not believe the amazing smell in the kitchen as this baked. It’s like Autumn put on her best perfume and has come for tea. Preheat oven to 325°F. Butter and flour 9x5x3-inch metal loaf pan. Bring about 3/4 cups of water to a boil on the stove and add the Chai tea bag. Drop the heat right down to low and let steep. Whisk the first 6 ingredients in medium bowl to blend (Can I be honest? I don’t do this. I add the spices and salt to the wet mix and then plop in the flour and baking soda afterwards). Beat together the maple syrup, sugar, oil and eggs in large bowl or stand mixer until blended, about 3 minutes. Beat in the dry ingredients in 2 additions (oops). Measure out 1/2 cup of hot Chai tea and beat it in, carefully. Scrape down the bowl and stir in the raisins. Transfer batter to prepared pan. Bake until a tester inserted into centre comes out clean, about 1 hour 10 minutes.